The animation is top notch, especially for a slice of school anime. The characters are interesting and more importantly their interactions cause you to hold on to that interest. The music is great, as is the sound design in general. Think of it as the concert band's equivalent to "Your Lie In April" minus some tears and plus some cuteness. Highly recommended. Characters: 7.5/10 Good characters although I did not immediately fall in love. Character development: 10/10 The way the characters progress is amazing. Started good but got fantastic. Plot: 9.5/10 Exactly as advertized and quite pleasant as well. Becoming a Band through the Power of Friendship! After watching the first episode, I'm not getting that "Must tell everyone to watch it" feeling that Your Lie in April gave me, but If we start trying to compare to what probably will be considered one of the best feels trips of all time, most other music anime will end up on the wrong note. The animation is amazing, story and setting is similar to K-ON! but more structured, Band idea is a new concept to me, and the show definitely has potential. I'm not a fan of a wavering, weak minded, indecisive MC; but I have a feeling she will grow as the show continues. I may stick around for the season or stop around 5 episodes. I do love my music anime, Enjoy! Although it is too soon to tell, it shows good promise that it will be up there as one of the few good music-based anime so far. I assume that they are gonna stick to classical music but I hope that they try some obscure or not well-known (but just as good) pieces of the genre instead of default favorites like the clip of "Morpheus in the Underworld" briefly heard in this episode. Hopefully it won't be another K-ON (which I do like but it was lacking) and it will try to stand on its own merits. Great start but a little slow. The first episode was a world builder. It felt like it was introducing the characters and letting you see the problems and future plot points. There were sadly a few tropes thrown in. But I'm glad for the most part this was a refreshing experience. I loved how the teacher immediately called out some girls for having shorts skirts. It immediately let us know this will be more than just fan service and cute girls and we will hopefully be lucky enough to have a good story. So far so good. 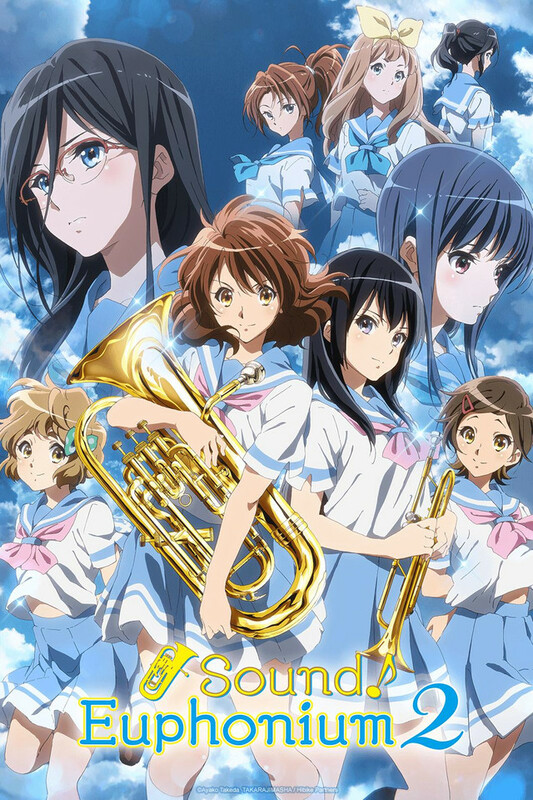 well as you just read, the same people who made k-on made euphonium, which is fantastic! i was a big fan of k-on and how could you not be? this story is a little more serious from the looks of the first and second episode (compared to k-on), but i can't solely judge it as such since it is only on its second episode. So far, the four mains are all just as fun as their predecessors in k-on. I love this! and let me tell you out of all the great girls in this, Sapphire is definitely my favorite. sweet but headstrong, yet shy about her real first name. ughhh how can you not want a gf like that!!??? but this is beside the point. i highly recommend this to you the reader. tl;dr Basically this show is on the verge of becoming a classic, a must watch. I really like where it's headed. Plot is clear, and characters are clear as well. There's not that usual boy drama or that usual shyness/like in the anime. Which is nice for a change. It's not the best but it's not bad either, it's a nice watch to go along with your other shows that are on queue. I recommend this if you're looking for a change of pace, or female characters leading anime. Take common plots used in animes: 1) It's high school! so let's join a club! and 2) I want to sing! Or be in a band! And add some originality to these overused plots. Instead of the regular old music clubs, aspiring singers, etc., they gave us BAND. Like brass band. How unique is that? I'm glad that this is being done. Enough with the guitars, the drums, the pianos, the violins (all of which are AWESOME instruments btw), but give this type of club some much needed spotlight. So far I've enjoyed it. The storyline is steady, calming even, and the art is pretty. The characters are all likeable so far. It's shaping up to look like an enjoyable anime.